A comprehensive photographic record of this popular tourist area from the late 19th century to the mid twentieth century. 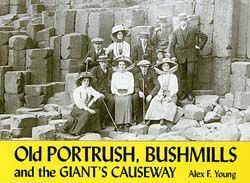 Includes such landmarks as The Portrush Hydropathic and Golf Hotel, Barry's Amusement's ferris wheels, the Old Bushmills Distillery, Kanes Royal Hotel at Bushmills, the Portrush Rocket Lifesaving Company, numerous pictures of the famous Railway and Tramway Co. and it's rollling stock and of course images of the Giant's Causeway and its visitors taken over several decades. The excellent photographs are enhanced by detailed and informative captions throughout.